What’s that? Ah, I see. EDITORIAL CORRECTION! Purple Ninja is being told that the producers had to pad out the runtime when Purple Ninja slew his opponent in an unexpectedly rapid fashion. Apparently the Dead Gentlemen didn’t think one hundred and twenty seconds of spleen-punching ninja-on-ninja action was enough to draw an audience. 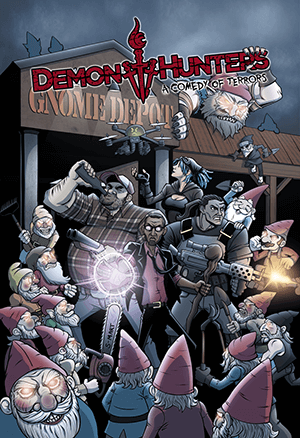 Now it is called The Gamers: Dorkness Rising, and is about RPGs or something. There is an ongoing Kickstarter campaign to produce a Blu-ray edition so vast in its offerings that it is worthy of bearing a film starring the Purple Ninja. As though such a feat were possible! Pledge your support, lest the Purple Ninja roundhouse-Kickstart your coccyx into your chest cavity! Today is my Birthday. I know that one can never take a day off from defending the world from evil, nor do I want to do such a thing. But during my constant vigil and scouting of the local area, I have found little evil to vanquish. How do you handle slow days or try to relax when you must be ever vigilant when an attack can come at any time? Many thanks for your advice and the epic example that you set. Ah, Robert, you are mistaken. Purple Ninja has never experienced a slow day! Evil does not take sick days! Evil does not have a pool of flex time available for vacations and unexpected family emergencies! Evil works around the clock, and so does the Purple Ninja! HoHO! You have too narrow a view of Evil, my friend. It will not always present as a slavering beast with razor sharp claws, or an undead hell-thing that hungers for human flesh. Like flatulence in the shower, Evil is pervasive and inescapable. It winds its way into every dark corner of society. It is the solemn duty of warriors like yourself and Purple Ninja to dive fistfirst into these corners and keep punching until whatever is hiding in there stops twitching. You must expand your parameters, young Robert! See the world as the Purple Ninja sees it, and no Evil will hide from your terrible, ninja-y sight! Poorly painted lines in a parking lot cause you to get a ticket for parking in a handicapped space? EVIL! Hunt down those who have neglected the upkeep of the asphalt. Perhaps they will care about properly marked parking spaces after losing the use of their own legs! Your “footlong” sandwich was a mere eleven inches long? EVIL! Teach the so-called sandwich artist a lesson on the importance of that missing inch with a one-inch punch to the duodenum! The deodorant you’ve used for twenty years has changed its formula and now you’ve broken out in a rash? Ooh, that is a special brand of Evil! The sort of Evil that seems insignificant, but will wear away at your very soul given enough time. Every aspect of your life will gradually be made worse, all to save half a cent per stick of deodorant. You must infiltrate the heavily guarded deodorant research facility and teach their head chemist that adding “Power” to something isn’t necessarily a good thing! So you see, Robert, Evil is all around! One must only look through the sunglassed eyes of the Purple Ninja. Now enough of this “slow days” nonsense! Get out there and rip Evil a new screamhole! But back that Kickstarter campaign first. Purple Ninja is pretty sure he gets residuals from that thing. HoHO! 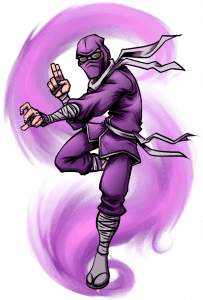 The Purple Ninja is the greatest Demon Hunter of them all, master of the Seven Essential Forms of Martial Arts, and star and sole-survivor of Pizzajitsu: The Motion Picture. The Purple Ninja seems pretty serious about that The Gamers: Dorkness Rising Definitive Blu-ray Edition Kickstarter campaign. Someone just lowered their pledge by ten dollars so Purple Ninja lowered their height by ten inches! Back it! Back it before it’s too late! 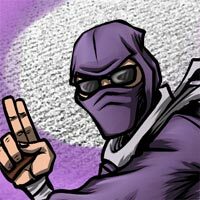 Have a question for the Purple Ninja? Send it to purpleninja@deadgentlemen.com.